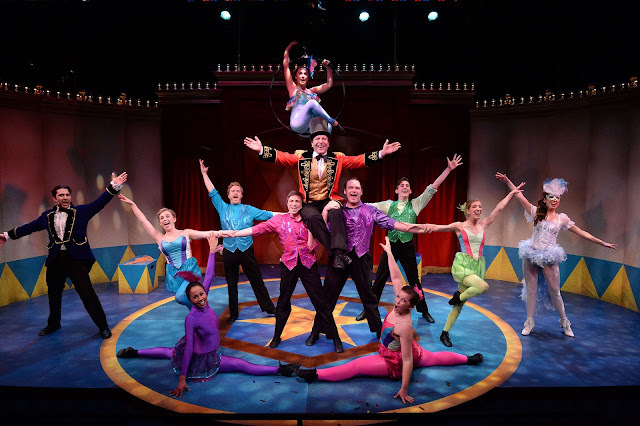 South Shore Critic: Moonbox's "Barnum": Rah Humbug? The Cast of Moonbox Productions' "Barnum"
What can one say about the 1980 musical Barnum, which, despite a weak book, managed to be hugely entertaining and had a lengthy run of almost 900 performances on Broadway? It tells the story of Phineas Taylor Barnum, the self-described king of hype and humbug, from 1835 to 1881. Barnum was never given its due by critics, but was nominated for ten Tony Awards, winning three, for its title performer, sets and costumes. Despite its sketchy Book by Mark Bramble, it had terrific jaunty Music by Cy Coleman and clever Lyrics by Michael Stewart. It was such a smash for audiences that it transferred to London and was revived several times over the past few decades. One need only overlook the libretto and enjoy the performances of the rousing songs in this unabashedly exciting, energetic, dynamic show in its present snazzy Moonbox Productions mounting. From the opening number, “There Is a Sucker Born Ev'ry Minute”, sung by Barnum (Todd Yard) in the pursuit of promoting his sideshow attractions, we're aware, via the presence of the Ringmaster (Zaven Ovian), that we're about to encounter Barnum's life as a loosely connected series of circus acts. His sideshow attractions include the Oldest Woman Alive, Joice Heth (Carla Martinez) who delivers the number “Thank God I'm Old”, Tom Thumb (Bransen Gates) who sells the number “Bigger Isn't Better”, and Jumbo the Elephant (who doesn't sing at all). Meanwhile not all is well in the Barnum household as he and his long-suffering wife Charity (Shonna Cirone) share in “The Colors of My Life”. Also along for the tour is Jenny Lind (Jessica Kundla), the Swedish Nightingale (“Love Makes Such Fools of Us All”). Later the Barnums exchange loving promises in “Black and White”. Still later Barnum is urged to “Come Follow the Band” and to “Join the Circus” by James Bailey (Ovian again) of Ringling Brothers, Barnum and Bailey Circus fame. Barnum's final attraction is the reprise of “There Is a Sucker Born Ev'ry Minute” as co-producer of The Greatest Show on Earth. 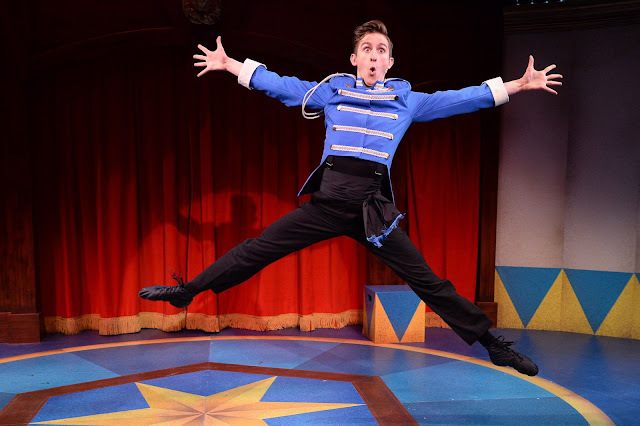 Bransen Gates as General Tom Thumb in "Barnum"
Stupendously directed and choreographed by Rachel Bertone, with great Music Direction by Dan Rodriguez, this production is a smashing success. The multi-talented ensemble consists of Dance Captains Matthew Kossack and Daniel Forest Sullivan, Joy Clark, Andrea Lyons, Dan Prior, Allison Russell, and Alexa Wang, all of them triple or quadruple threats who demand to be mentioned. It's a cast of thousands (well, OK, a baker's dozen; that was a bit of humbug). The creative work includes the perfect Set Design by Cameron McEachern, bright and beautiful Costume Design by Marian Bertone, fine Sound Design by Brian McCoy, and electrifying Lighting Design by John Malinowski. This was an extraordinarily complicated show to present and the hard work shows, even thought they make it seem so easy, especially those solo showstoppers Martinez (with great deadpan delivery) and Gates, a fabulous find whose singing and dancing were absolutely infectious. Yard kept things together with a terrifically animated presence. Bertone's inventive choreography (though too dependent at times on the jazz hands made iconic by Bob Fosse) keeps everything fast paced and the acrobatics quite believable. It's not Cirque du soleil, but it's not hogwash either, as it juggles all the elements of the greatest show on Tremont. Back in 1980, just after the opening of Barnum, this critic was present for a talk by Stewart in which he stated he was through with Broadway and that his type of musical was no longer in vogue; he then conducted a quiz about authors of musical comedy librettos, which this critic won, telling Stewart that his gift was like manure in that it only did any good if you spread it around (a reference to his Hello Dolly work). He did subsequently work on a few musicals (even including a sequel to Bye Bye Birdie) which by and large didn't meet with much acceptance, but he at least showed that he was game for it. The prize for winning the quiz, incidentally, was an autographed (by Stewart) original cast album LP (remember those?) of the then-new Barnum. ...Jenny Lind...and my poor Tom Thumb...so my kind of humbug's disappeared. Pity”. Or maybe not, if you've been paying attention to the last six months in politics. Perhaps hype and humbug (sadly, of a much more sinister type) are still very much with us. Pity. BLO's "Marriage of Figaro": Droit d'Employeur? Odyssey Opera's "Dwarf": Diminutive or Gigantic?